Physical Web is a technology built by Google that allows you to generate beacon notifications on mobile phones, without needing to integrate an SDK in an application. It is an open standard and it lets the beacons interact with your phone using physical web URL through the Eddystone-url frame. So how is it different from Nearby? While Nearby notifications only work on Android, through the Google Nearby app, Physical web notifications work both on Android and iOS. 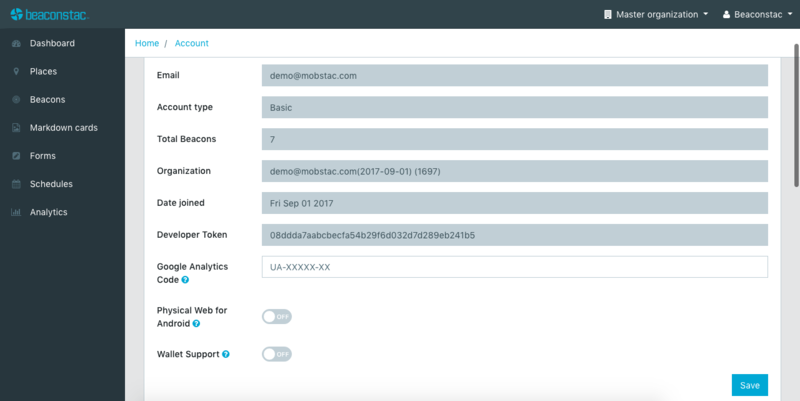 Physical Web notifications, given their openness, reach out to Android devices via the Google Nearby app (which is a native app on most Android phones) and to iOS devices via NearBee & other apps built specifically to receive these beacon notifications. 2. Nearby notifications are language specific but Physical Web notifications do not have this constraint. What this means is this: if you set up your notification in a particular language, say English and from among your audience's devices a particular device's primary language is something other than English (say Spanish) then that user would not receive any Nearby notification but would still receive a Physical Web notification in English. Note: the above example is for an Android phone. Thus, Physical Web holds importance if you want to make your notification available to all devices irrespective of their language preference and if you wish to also reach iOS users using NearBee. You can turn it on from the Dashboard on the Account page by switching the toggle button Physical Web for android ON and hitting Save.